Jalandhar: LPU in association with Punjab Amateur Body-building Association (PABBA) is organizing a 2-Day mega event ‘MR India-13th Federation Cup’ at its campus. The competition is held under the aegis of Indian Body-Building & Fitness Federation (IFBB). Close to 350 body builders representing different Indian states and national bodies are competing for the coveted title of Mr India. Competitions are also going on for 51st Junior Nationals, Veterans & Physically challenged, under 22 categories. 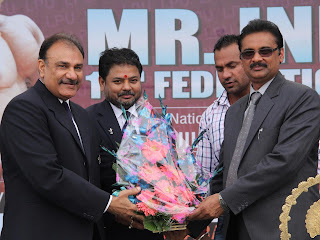 The championship was declared open today by the chief guest LPU’s Chancellor Mr Ashok Mittal, who was accompanied by President of PABBA, Dr Randhir Hastir and General Secretary of IFBB Mr Sanjay More accompanied him. On this occasion, previous year Masters champion and Hollywood Star, Varinder Ghumman, who is also featuring with super star Salman Khan in a forthcoming film, was also present to boost up the participants. An expo is also arranged with various stalls displaying equipments and machines for maintaining body fitness, health related literature and body growth materials. Talking to Media Dr Hastir endorsed the championship as a youth development programme which teaches students to be away from drugs and usage of other intoxicants. He also highlighted about illustrious and recent achievements made by IFBB and PABBA, in the annals of national, Asian and world level body building championships. Chancellor Mr Mittal said that It is a matter of Pride for LPU to associate in organization of national body building championship at its Campus. He desired that coaches and managers continue playing their major roles in developing more and more body builders of eminence. These should further participate at Asian and International level competitions to bring laurels to India, in this field too. Congratulating eminent national body builder Hira Lal on winning silver medal recently for International Championship, Mr Mittal also appreciated persons attached to IFBB and PABBA for their selfless work. I really like this blog.. It's a very nice post I have come across. I really like this post very much. It's a very appreciated post. Thanks for sharing. Keep blogging…..
With this in mind the ethos of our business is one of continual evolution. We consistently strive to provide our customers with the most innovative vehicle body builder solutions for all manner of commercial vehicles. Do you want a shorter valance, or one that will hang down about halfway? Now is the time to use your creativity, and maybe draw a sketch of the way you want your curtains to look for reference. This was definitely one of my favorite blogs. Every post published did impress me. Thanks for sharing such a nice info with us. I will share this with all my friends. Great Post , Thanks for Sharing this post . Great Post , Thanks for Sharing . This post is great, explanatory, interesting and super helpful. Bookmarked it already. Well done! wow awesome post thanks for sharing this interesting post. I like you article very much, because the information you have shared is useful in our daily life. I hope that you will brought us more in future. I really loved reading your blog. thanks for sharing this interesting post. Thanks for Sharing this Post . Thanks for your sharing ... in the annals of the national, Asian and world body building championships. I was diagnosed of herpes virus in 2015, I have tried all possible means to get cure but all my effort proved abortive, until a friend of mine introduced me to a herbal doctor called Chief Dr Lucky, who prepare herbal medicine to cure all kind of diseases including herpes virus (Herpes), when i contacted this herbal doctor via his email, he sent me herpes virus herbal medicine via courier service, when i received the herbal medicine he gave me step by step instructions on how to apply it, when i applied it as instructed i was totally cured from the virus within 3 weeks of usage. Contact this great herbal doctor today to get your cure. Very nice blog and article and I have found very useful information so I will come back for sure. If you are interestingReal steroids online source find more info here.